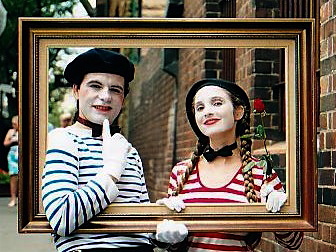 Thru a Picture frame, these mimes move thru the space. As they travel, they use full expression and quirky mannerisms to interact and engage with their audience response. A very sweet and cherished act ...Cuts thru all age and cultural boundaries to get to the heart of the matter!